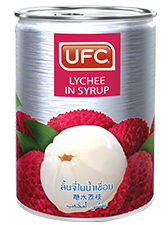 UFC Lychee in Syrups is made from finely selected Hong Huay lychees that are a mouthwatering size, has great textures and smooth milky white colours. Our dedication allows you to enjoy authentic and fresh flavours of the lychee. Of course, you can enjoy UFC Lychee in Syrup as a cold desert by simply adding ice.